I'm going to start this off with one very simple request: if you ever get a change to go to Ireland, go to Bunratty. Seriously, despite a problem with some mis-information by the interpretors, it is completely fabulous. The biggest issue with Bunratty is they have no clue of what a gem they really have. The castle and the grounds cover everything from the 15th up to the early 20th Century. It's 500 years of history in one little park where you can peak back in time. The castle, the homes, and many of the artifacts are all extant. The problem is that the interpretors have zero idea of what they are talking about. I think Bunratty got hit hard during the recession of '08 and is just starting to bounce back. 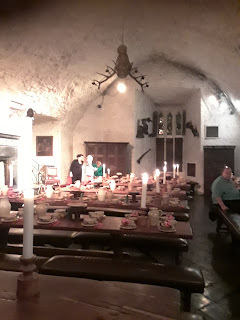 I recall the medieval banquet I went to uh....many, many years ago and it was very different from what it is now. Not that it's bad now - it's definitely better than the Medieval Times in the U.S. but only just. Some issues - the costuming. Okay, granted, that's the first thing I would notice. The castle was built in the mid 15th Century. The garments the actors and actresses wore were want-to-be-16th Century. I get that you need garments that can be used by other actors and can be cleaned easily but there are plenty of garments from that range that fit the bill that don't involve zippers up the back. ...Or panne velvet. Really, I think hoppelande gowns or even just really basic sideless surcotes (which were worn for festive occasions up into the 16th Century) over a-tunics would be perfect for the actressess. The sideless will fit pretty much any size and the a-tunics are very easy to make. Making them out of linen and wool - to show off what would have been worn in Ireland anyway- would also look stunning. For the men, a short hoppelande or a liene with hosen would look nice. The second problem was the entire dinner. Don't get me wrong - it was delicious- but BBQ ribs with tomato sauce (they gave me mine without the sauce) and potato soup are pretty distinctly post period for the castle. It's clear they wanted to give a 15th/16th vibe. The potato was introduced from the New World in the 16th C - but you don't see many recipes for it until the later half. Even then, it's more baked potato stuff. The tomato isn't commonly eaten until the late 18th/early 19th C.
Also, the actors and actresses claimed that any cutlery other than a knife wasn't a thing which is blatantly false. I'm not sure why that is even still a common myth. We had to eat our soup without a spoon. This goes directly against the Irish archeology finds in southern Ireland that include...wooden spoons. Now, this entire event could have been an excellent learning experience and still allowed the castle to get away without having spoons. Really, in the middle ages, people were expected to bring their own cutlery - to include spoons. Since we, as 21st guests, don't regularly keep our flatware on our persons, the "host" of the evening could declare that they don't have enough spoons for more than the household. Therefore, the guests will need to sop up their soup with the bread - which is what we pretty much did without anyone telling us too. Still, teaching about sopping up the soup and going into that part of history would be much more accurate and truthful than just saying spoons weren't a thing despite direct evidence against that. As for forks, they aren't a thing until pretty late in the 16th c so it's doubtful they'd be a thing in Ireland for the time that the medieval banquet is trying to re-create. Still, providing a spoon and a knife and explaining about the archeology of Ireland would be beautiful. A couple of days later, I went back to the folk park to get some better pictures of the castle (since I was an idiot and forgot my camera in my bag back in the B&B) as well as check out the rest of the park. My memories of the park many years ago are a bit fuzzy but I do recall the 19th C village and the people dressed up talking about various aspects of pre and post famine Ireland. I wanted to get photos of some of the tapestries in the castle and other antiques because, what Bunratty does have, is absolutely fabulous artifacts from the 15th ~18th Centuries. When I went into the main hall, a gentleman was dressed up in far better 16th Century garb than I saw at the banquet. However, what I heard him say made me cringe and I had to walk away. According to him, the Irish didn't have glass for windows until the 17th Century. /facepalm The way he said it, it made it sound like glass hadn't been invented yet. I later had to explain to a few people that - no, glass is ancient. Even the Romans had it. I also eventually piped up a bit and did point out they had shutters on the archer windows. It's not like our medieval ancestor let all the heat from the fireplace go out an open window in the middle of winter. We have manuscripts from England, Germany, and Italy showing glass windows as early as the 14th Century. Now, you wouldn't want to glass over an archer's window because it would just get in the way. Having shutters that come inside the window and covering the window with those fabulous heavy velvets or tapestries also kept the cold outside. Despite what the gentleman said about it being very cold and how spoiled we are with our heating and a/c - it's just not that bad in the middle ages. Anyone who has been camping in the winter knows a good fire will keep you pretty darn warm. Add that having four walls and roof? Well, I know I've been in power outages for as long as a week in winter. A good fireplace, good curtains, and warm clothing will keep you plenty warm. Another myth the gentleman spoke about that made me cringe was that, apparently, according to him, there were no vegetables or fruit in Ireland before Sir Walter Raleigh brought back the potato. .... I'm not joking. That's what he said. I guess carrots, turnips, onions, and apples which were common in England never made it across with all the nobles going back and forth? Of course, that's not the least bit true. The truth is that apples have been a part of Ireland for at least 3,000 years. In fact, crabapples, hazelnuts, and waterlily seeds were part of the mesolithic diet. So, they had fruit. Various types of cabbage were a thing since the Roman era (I mean, come on! Irish and boiled cabbage is almost more Irish that potatoes!!) with the Savoy cabbage being introduced in the late 16th century. The biggest part of the medieval Irish diet, however (which both this gentleman and the actors at the banquet overlooked) was cheese. Dairy was a huge part of the medieval Irish diet. Add that with some fish, bread, and apples...and I think they ate rather healthily in times when there wasn't a famine. Yeap, he did the whole life expectancy thing. While life expectancy was lower before, well, antibiotics, it didn't mean you dropped dead at 30. Nor did it mean that a bunch of people were dying at 30. Rather, a LOT of people died before they got to be five years old and a lot of people died when they were in their mid to late 60s. You get an average life expectancy of 30 from that. Yes, more women died in childbirth than they do today - but the rate (thank you Dublinia for getting right!) was 15% of women died in childbirth. Not exactly the 50/50 chance that many people make it out to be. Another aspect that the gentleman said that rubbed be the wrong way was that women were second class citizens in Ireland and were expected to just sit around and have ten children, with a couple of male heirs maybe making it to adulthood. Well...no. I mean, just look at Grace O'Malley who is still considered one of the greatest pirate Queens in history. She had control over her own lands, ships, and got such a reputation as a pirate, that Queen Elizabeth of England demanded an audience with her. Also, Grace had three kids - not ten. Anyway, on to the beauty that is Bunratty castle itself. Late 15th Century/early 16th C tapestry on one of the walls in the great hall. Luckily, my camera got an excellent shot of them. Late 16th Century tapestry. This one was the best preserved of the lot. A lovely gothic window. The windows appear to be a mix of glass from various time periods put together with some modern methods. Really, most of the glass was quite lovely up close but was all recreations of other pieces. This bed. Let me tell you how much I love this bedroom. The bedspread is a bit blurry but is is, in fact, early 17th Century Jacobean embroidery. Real. Not a recreation. And the canopy? I got as close as I dared to get a good close up of the polychrome embroidery on the purple silk. Yes, it is a real late 16th/early 17th Century embroidery piece - most likely Italian. A similar style of embroidery is at the Hermitage and seen in in this embroidery pattern book form 1608. See that embroidery? I know it's difficult - there was no way to get close to it as the room was roped off. However, the embroidery style? This green velvet chasuble has early 15th Century Embroidery all over it. *dies* Did I mention that the Bunratty Folk park have no clue what they really have? This is evidence of that... This poor chasuble is back in a corner where no one can see it properly and yet early 15th Century embroidery?! ?